BARBARAELLEN KOCH PHOTO | John Dunleavy, Millie Thomas, Jodi Giglio and Bill Bianchi. Riverhead Town council candidates, Republican incumbents John Dunleavy and Jodi Giglio and Democratic challengers Bill Bianchi and Millie Thomas, took the stage on Thursday night at the Suffolk Theater for a debate co-sponsored by the Riverhead News-Review and RiverheadLocal. The four answered questions about downtown, Enterprise Park at Calverton, Route 58 and more, even getting the chance to ask each other questions during the debate. Check out their responses by clicking here or below. board2 from Carrie Miller on Vimeo. BARBARAELLEN KOCH PHOTO | Sean Walter and Angela DeVito on the Suffolk Theater stage. The gloves came off in the final debates between candidates for Riverhead Town Board Thursday night, with Democrats in general criticizing the incumbent Republicans for the clear-cutting at the Shops at Riverhead site, and Republicans accusing Democrats of not offering any solutions. The candidates also jumped on one another with plenty of direct criticism and sprited, and at times raucous,back-and-forth exchanges. The debate, called “Riverhead at a Crossroads,” was sponsored by Riverhead News-Review and RiverheadLocal and held at the Suffolk Theatre. The debate was divided into two segments, one with the council candidates — Republican incumbents Jodi Giglio and John Dunleavy and Democratic challengers Bill Bianchi and Millie Thomas — and one between the supervisor candidates, Republican incumbent Sean Walter and Democratic challenger Angela DeVito. Questions were asked by Michael White, News-Review editor, and Denise Civiletti, RiverheadLocal publisher, rather than from the audience. Mr. Dunleavy was up first, and was asked whether it was a mistake to allow the clear-cutting of vegetation at the Costco/Shops at Riverhead development on Rout 58. The land clearing there infuriated residents in Foxwood Village, where Mr. Dunleavy lives, and Millbrook Community, a mobile home park east of the development. At a previous debate, Mr. Dunleavy blamed a Foxwood Village resident who voluntarily monitored the development at Planning Board meetings for not knowing what he was doing. This time, he apologized to the people at Foxwood Village, and said there was no one to blame. “I didn’t know they were going to clear-cut the whole shopping center,” Mr. Dunleavy said. But he added that the evergreen buffer the developer is required to build will fix the problem. But Mr. Bianchi specified Mr. Dunleavy for criticism on several occasions. “He’s saying everything is great, when his own supervisor is saying we are headed for financial disaster. Maybe the problem is [the current board members] don’t know what’s going on,” Mr. Bianchi said. “We have some council people who are not even here in the winter, they are in Florida,” he said. “If you’re not going to be at the meetings, then resign from the board,” Mr. Bianchi said. Mr. Bianchi pointed out that Mr. Dunleavy missed a meeting on Oct. 16, when Mr. Dunleavy was on a cruise to celebrate his anniversary and his wife’s birthday. “I’m allowed to take a vacation,” Mr. Dunleavy responded, indicating he took two weeks off this year. Later in the debate, Mr. Dunleavy brought up the issue of property Mr. Bianchi owned in Patchogue where the state claims a Bianchi family-owned operation there contaminated the soil with pesticides in a greenhouse business. The property is listed as a state Superfund site. “I wasn’t going to bring this up,” Mr. Dunleavy said, even though he was waiving documents about it in his hand. He said he mentioned the Superfund site because Mr. Bianchi was being negative. Mr. Bianchi said his family owned that land until the early 1990s and a pesticide used to kill termites was legal when they applied it, but it was later was made illegal by the state due to its affects on groundwater. Candidates also battled on financial issues. Republicans said they have cut spending, and that when the Enterprise Park at Calverton is subdivided, they will be able to derive revenue from land sales there, which will stave off tax increases. Democrats said that while the EPCAL fast track bill has been approved and the subdivision is nearing completion, the EPCAL buildout is still expected to take more than 10 years and the town will still need to spend more than $20 million on infrastructure and sewer improvements at EPCAL. With town reserve funds set to run out in the next two years, there still is no guaranteed revenue for the next two years to stave off a potentially big tax increase that Mr. Walter and town auditors have warned about, Ms. DeVito said. She repeatedly said the town should petition the county for a portion of the county-collected sales tax, since a chunk of it comes from Riverhead stores. Ms. DeVito was critical of Mr. Walter’s statement that the town might have to borrow against the land at EPCAL to borrow money to lower tax increases. She asked him how he would raise revenue in the next two years to avoid a giant tax hike. The supervisor has said the town could face a 20 percent tax increase in the future if it has no reserves to offset spending. Another proposal the supervisor suggested was working with Governor Andrew Cuomo to find an “equity partner” who would provide financing for construction projects, and would get a piece of whatever profit it derived from sales at EPCAL. 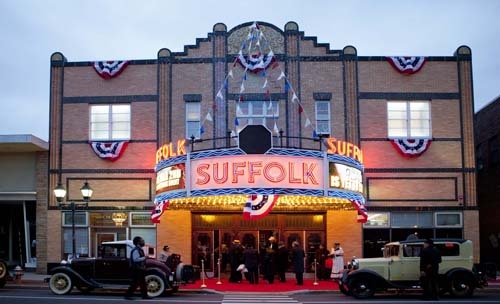 He said the board has helped bring new businesses to downtown, including the Suffolk Theatre, and proposed the legislation signed by the governor on Thursday designed to fast track development proposals at EPCAL. Mr. Walter also questioned Ms. DeVito’s level of commitment, saying she “quit” the Riverhead school board. Mr. Walter later said there are many pressures involved in being supervisor, and he watched his own mother slowly die while he was in office in 2012. Ms. DeVito said she’s dealt with stressful issues while in leadership positions in the past, including the death of a child, and had not stepped down. On the issue of downtown, Ms. DeVito said there are still issues with drug dealing and prostitution, and despite all the efforts, it’s still not a place to bring families. He said when he took office, the Casa Rica restaurant was still open and was the scene of a number of violent incidents. He said it took his administration six months to get it closed, but they eventually got it closed. Ms. DeVito at one point accused the supervisor of making fun of her, and said his answers to questions were cavalier and sarcastic. Mr. Walter said he wasn’t making fun of her — that he just had better answers — and was sorry she felt that way. The supervisor said that during Ms. DeVitos’s tenure on the Riverhead School Board, the district spent two-and-a-half times the rate of inflation, and also proposed a $120 million bond that was rejected by voters. Ms. DeVito countered that the school board instituted a spending cap when she was on it. Ms. Thomas touted her experience owning a Real Estate business in Wading River and she was able to get that business through the crisis of the economic downtown without laying off any employees. Among some of the specific questions asked of candidates, on the question of whether site plan authority should be taken away from the Planning Board and given back to the Town Board, which had that authority prior to 2006, only Mr. Bianchi said he favored doing so, among the council candidates. “They are doing a great job other than one slight mistake,” Mr. Dunleavy said of the Planning Board, and in reference to the clear-cutting at the Costco site. The supervisor candidates were not asked that question. As for whether the town should update its entire master plan, Ms. Thomas and Mr. Bianchi both said it should be “tweaked” but not overhauled. Mr. Dunleavy said he would want to get feedback from the public on that issue and Ms. Giglio said she thinks the 2003 master plan is “working very well” now, and has greatly reduced the maximum possible population of the town. Ms. Thomas said the town is “broke” and needs to find grants or other revenue sources to offset spending. She said EPCAL has infrastructure problems that will be very costly. On the Costco site, she said the incumbents “totally dropped the ball,” and she believes the Town Board should have more interaction with the Planning Board on proposals. The current Town Board is “pro-development,” she said. “This Town Board is very pro-active in listening to the community,” Ms. Giglio responded. It adopted new rules to require public hearings on commercial site plan applications, which was never done in the past, and is now requiring 50-foot buffers between homes and large commercial developments. She said the Town Board cannot “impose its will” on the Planning Board. Mr. Dunleavy and Ms. Giglio frequently said their opponents identify problems but give no solutions. Ms. Giglo was asked about her failure to get building permits and certificates of occupancies for expansions on her own home for several years and said she now has those permits, and is willing to pay the additional taxes she wasn’t assessed for on these additions over that years, a figure she estimates at about $10,000. “It was a big mistake,” she said of not getting the permits. “I put it on the back burner and forgot about it” while attending to business and town matters. In their closing statements, Mr. Dunleavy said he was on the board that negotiated a contract with Riverhead Resorts that brought the town $7.5 million, even though the land was never sold or developed, and that he has also negotiated cell tower leases that have brought revenue to the town. Ms. Thomas said she’s a business person and not a politician and noted she’s been in leadership positions with the Long Island Board of Realtors. Ms. Giglio said she has been mindful of taxpayers and has found innovative ways to help taxpayers, such as by calling for the rebidding of the town garbage collection contract, which saved $2 million, as the board liaison on garbage issues. Mr. Bianchi, who was a state assemblyman for 22 years when he lived in the Bellport area, said it was necessary to work with both parties in that role and the same is true in the town. He again criticized Mr. Dunleavy, this time for leaving a press conference in Wading River earlier this year because the Democratic candidates were there. “I’ve never in my life heard anything like that before,” Mr. Bianchi said.